The MACH 4S provide all features of an industrial printer with a wide application range. The print mechanics and the chassis are made of high-quality materials and perfectly match in terms of shape and function. The large, colored touchdisplay with self-explanatory symbols offers best operability. Labels and ribbons are easy to insert from the front. The centered material guide eliminates any need of adjustments. The hightech electronic board integrates all the needed interfaces as standard and is ready for any connection. 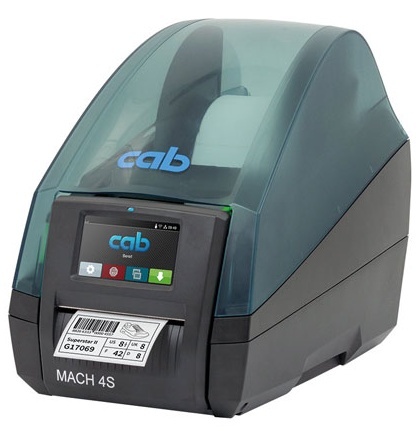 cab MACH 4S Label Printer Type B with tear-off edge for printing on all materials that are wound on rolls or reels or fanfold. cab MACH 4S Label Printer Type P with peel-off function for printing on all materials that are wound on rolls or reels or fanfold. In addition, the labels can be dispensed. cab MACH 4S Label Printer Type C with cutter for printing on all materials that are wound on rolls or reels or fanfold. From 12 mm in height, the labels and continuous materials can be cut.